On Friday 4 August I received an email indicating that there was a Little Egret in Whiting Bay on the shore opposite the primary school. The sighting was confirmed and the information put out on the arranbirding website. This was to be the first of ten such reports between Friday 4 and Monday 7 August. Most of these were from the Sandbraes end of Whiting Bay but some were also from Clauchlands in Lamlash Bay. This was only the second record of Little Egret on Arran. The first one, at Sliddery Shore on 1 July 2013, did not hang around, but at least this latest one stayed for a few days, enabling many to enjoy this pure white heron with black legs and yellow feet hunting in the shallow pools on the shore. The liveliest hunters among the herons, they feed chiefly by walking through water and snapping at prey, or by running and agitating the water with their feet to disturb prey. The excellent photographs by Nick Giles capture the essence of the bird. It first appeared in the UK in significant numbers in 1989 and first bred in Dorset in 1996. Its colonization followed naturally from this range expansion into western and northern France in previous decades. The map shows the winter records between 2007-11 from the national bird atlas survey conducted by the BTO and its partners. This is hugely different to the previous national winter atlas conducted between 1981-84 , when there was a grand total of one record. 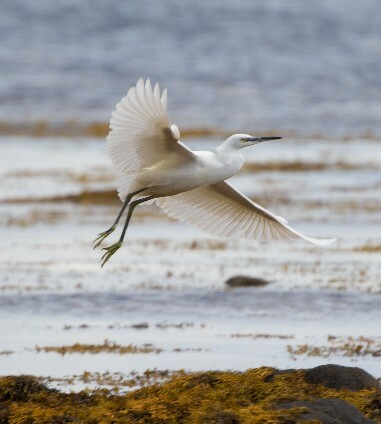 The Little Egret is now at home on numerous south coast sites, both as a breeding species and as a winter visitor. The population increase has been rapid, with over 750 pairs breeding in nearly 70 colonies in 2008. They are colonial nesters, building near water, in trees and bushes or sometimes on rocks or cliffs. Colonies can range from a few nests up to a couple of thousand, usually in association with other herons, including the familiar Grey Heron. Following the first breeding record in England in 1996, the first in Ireland was 1997, the first in Wales was 2002, but to date there is no confirmed breeding in Scotland. It is really a bit strange that birds breed in Lancashire and Northern Ireland, but not yet in Scotland--as far as is known. 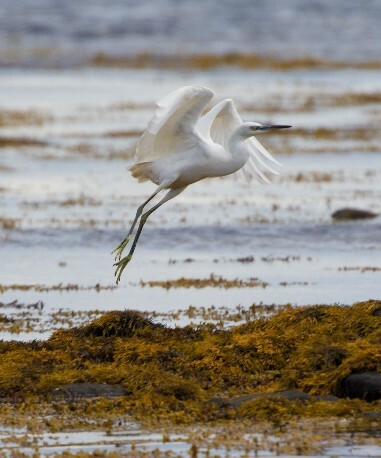 Indeed Mark Holling of the Rare Breeding Birds Panel has put out a plea for any information on possible breeding of Little Egret in Scotland. The expansion continues and it can only be a matter of time before it is widespread in coastal and inland water habitats in Scotland, including Arran.